There are two prizes that have really peaked my interest. I'm very new to blogging, having just started Arrows Sent Forth back in July of this year. It's been a lot of fun, but I also constantly have this feeling that I have so much to learn. There's lingo that sounds like a foreign language, technical skills I lack, and my overall naivete. I'm heading to a portion of the Blissdom Conference in Nashville, Tennessee in January to help me get a leg up, but the two prizes below sound great too. A MatadorU writing course: I was a journalism major, and since leaving school most of my writing has consisted of boring press releases, grant applications or dry language for websites. While writing for a blog provides a lot of freedom, I sometimes still feel stuck in a writing rut. I think this would help me with my creativity. It also has a focus on travel, so it's right up my alley. Travel Blog School: If I had to put a name to the learning opportunity I most need, I think I'd call it Travel Blog School. Alas, it already exists and one of these days, whether I win this prize or not, I'd love to attend. So there you have it, two more fantastic prizes. If blogging/writing doesn't interest you, I promise there's something for everyone. (I mean, really, who doesn't want an iPad for Christmas?) You'll find a full list of prizes here. 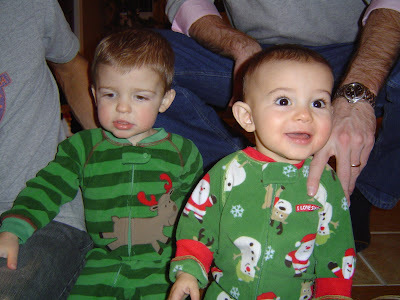 My nephew and the arrow getting ready for bed last year on Christmas Eve. Christmas at the Zoo: I've mentioned before that Indy has a wonderful zoo. A true highlight of the holiday season for many families around here is this event. The zoo is all decked out for the season, including thousands upon thousands of lights. Plus, the cold weather animals like the polar bear, who is usually pretty comatose when we visit in the summer, springs to life. Monument Circle: I love the circle in the heart of downtown Indy, and it's at its finest right now. The monument itself becomes the world's largest Christmas tree. It's so fun to wander around with a cup of hot chocolate. This is actually where my husband proposed to me back in the day. Santa Claus, Indiana: Indiana has a town called Santa Claus. How fun is that? And they take full advantage of the name this time of year. I'd love to get there arrow down there for some holiday cheer. A drive through Santa's Land of Lights, a visit to the Candy Castle, maybe even his first photo with Santa. The best part is I've never been either so it will be new to all of us. That's what I'm dreaming of this Monday. What are your favorite holiday adventures or destinations? This post is a part of Mondays are for Dreaming at The Mother of All Trips. It certainly helps if we bring him places that he finds interesting. That's why I knew lunch out at Hangar 5 (here in Columbus, IN) would be a hit. The name "hangar" comes from the fact that its located right at the small terminal of our tiny airport. So you can literally watch planes land and take off while you eat, just outside the window of your comfy booth. 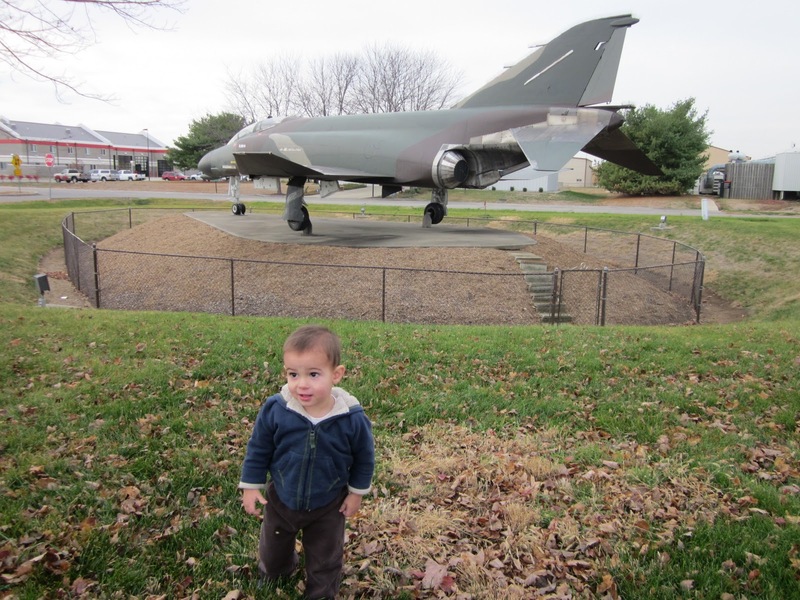 Does anyone know a little boy who isn't interested in planes? Neither do I. Waving bye bye to a departing plane. The food is pretty good, too. Hangar 5 is known around town for its breakfast, which you can order anytime of day (and if you order a pancake for your kiddo, it comes in the shape of Mickey Mouse). We've been to Hangar 5 many times and the food has always been delicious. Besides their great breakfast, I love their BLTA sandwich. And my father swears their meatloaf is the best he's had. The decor inside the restaurant is all about aviation. Model planes hang from the ceiling, and the wait staff is dressed as flight attendants and pilots. There are usually a few small private planes parked just outside the restaurant, and a fighter jet is always on display out front. Pretty cool, even if you're not an 18 month old little boy. Getting him to hold still and look at the camera? Pretty impossible these days. Note: Because it's just a small terminal for private planes, there's no invasive scans or pat-downs required to visit. 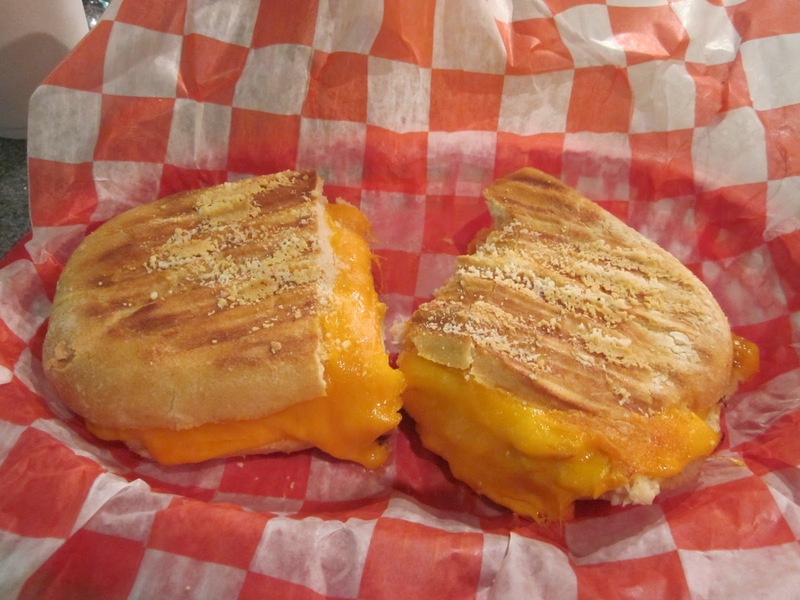 This post is a part of Wanderfood Wednesday at Wanderlust and Lipstick. I mentioned in an earlier post that the prizes available in the Passports with a Purpose campaign is not why I'm donating to this cause. Buuuuuuut... they are pretty sweet, and I'd be thrilled to win one. (A complete list is available here.) I said I'd be featuring some of these in the next few weeks. Here's one of my favorites, from one of my favorite blogs, Trekaroo. I love this prize for three reasons. 1) It's not site-specific (well, other than being limited to North America). We haven't mapped out our travel plans for 2011 yet, and so if I were to win (or if YOU were to win! ), I wouldn't be committed to a specific location. 2) Homewood Suites are very family-friendly. Let's face it, it can be hard to find bedtime bliss in a traditional, one-room hotel room. At Homewood Suites, you have more room, plus a kitchen, meaning you can prepare some simple meals for your family. 3) Lodging expenses are one of the big ticket budget items when traveling. This takes care of that for a weekend away, or reduces it significantly for a longer trip. So donate now, and enter to win this fabulous prize! Many thanks to Homewood Suites and Trekaroo for making this fantastic prize possible. And if you don't read Trekaroo regularly, please check them out. They often feature great travel discounts and giveaways, and also offer a great link-up every Thursday called Spotlight Thursday where bloggers feature some great outings and trips. 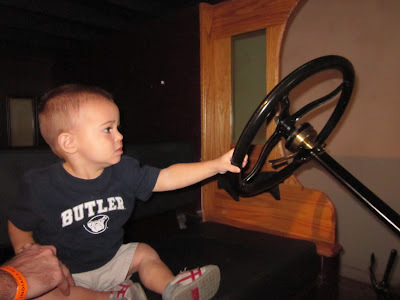 Recently we brought the arrow to the Indiana Historical Society because we thought he'd think it was cool (what with the rooms all decked out in early 1900s Indiana garb that he could explore, and the fancy actors and actresses who fawned all over him). Little did I realize one of my lifelong dreams would come true. I'm terribly un-musically inclined, although I love it. (I'm also really unathletic... I did not hit the genetic lottery, apparently. But I also love sports, so at least I haven't let these deficiencies get the best of me.) Despite being tone deaf, I've always harbored this secret wish to play the violin. 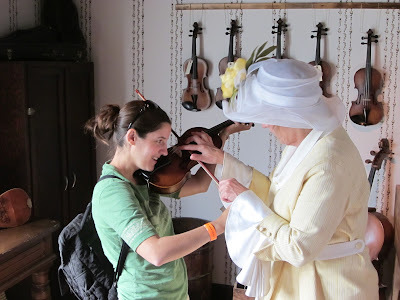 When we stepped into the recreated violin shop (part of the You Are There exhibit), and they offered to let us play one, I knew it was my big moment! And it wasn't all about me. The arrow got to fulfill one of his dreams too... driving a car. A full restored Model T? Nice ride, kid. You can read more about our visit to the Indiana Historical Society by reading my post at the Indiana Insider. If you're looking for a fun outing with kids in downtown Indianapolis, I highly recommend you consider going to the Indiana Historical Society. The arrow was a little young (not only to appreciate what he was seeing, but also because he got a little squirmy.) If you have school-aged kids, though, this place is fantastic--fun and educational. And the building itself is right off the Canal Walk, so it makes the perfect beginning or end point to a beautiful long walk. Disclaimer: My family was provided tickets to the You Are There exhibit. The opinions expressed in this post and at the Indiana Insider are very much my own. Two years ago, when I was about six months pregnant with the arrow, my husband and I headed to Tampa for a pre-baby getaway. We had a great time, and have been contemplating heading back there since. We were pretty sure the arrow would love the beach. 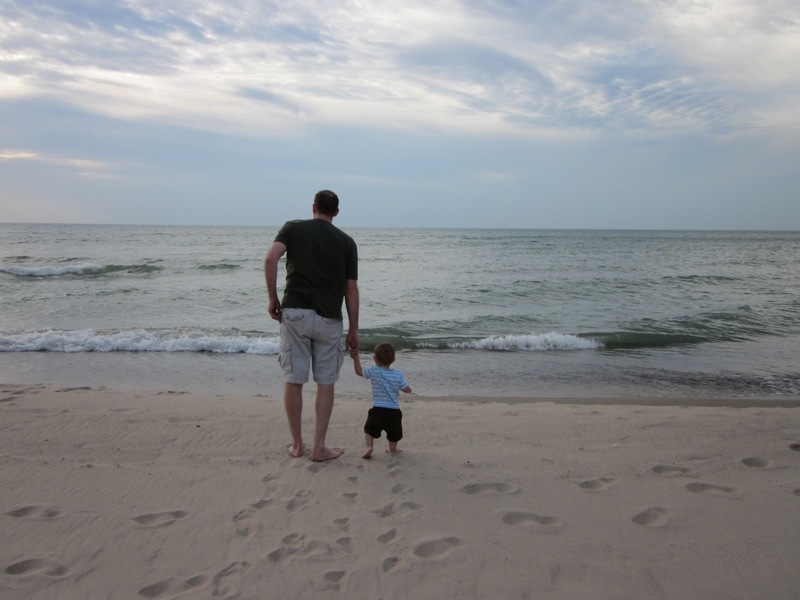 Then we gave him a little taste at Warren Dunes along Lake Michigan in September. And that sealed the deal. I've got to get this kid back to the ocean. So I'm knee-deep in trip planning as we speak. And these photos are my motivation. This week's theme is "What Inspires You?" Such an intriguing question. I decided to focus on what inspires this blog. 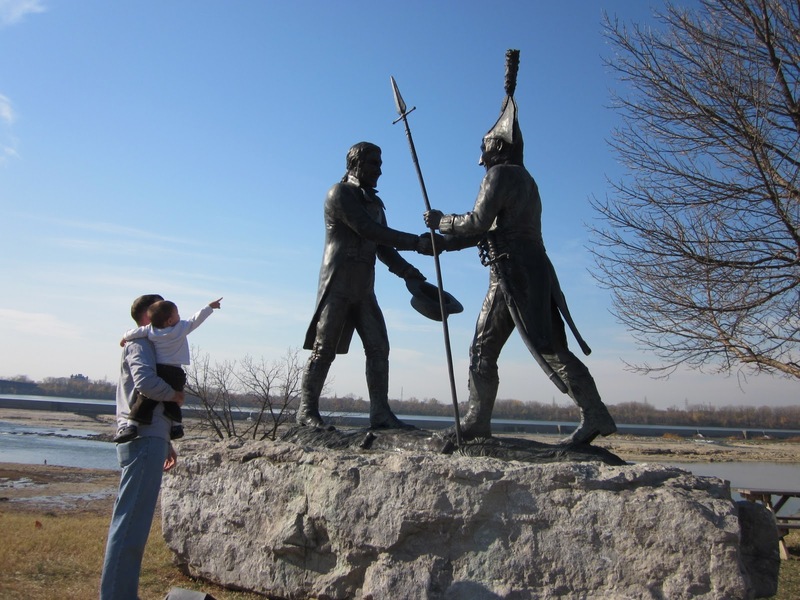 This statue marks the exact spot along the Ohio River where Lewis met Clark and the two began their journey. My husband. My son. Travel. Discovery. Exploration. Nature. I took this picture on Saturday at Falls of the Ohio State Park in southern Indiana. (We spent most of our time there exploring the amazing fossil beds). We stopped to admire this statue and reflect on its historical significance. I'll be writing more about our adventures there soon. 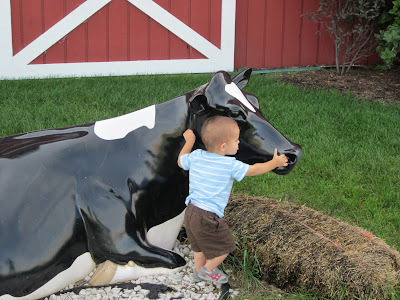 Last week at the Indiana Insider I blogged about our stop at Fair Oaks Farms in Northern Indiana on our way up to Warren Dunes State Park back in September. Fair Oaks Farms is one of the nation's largest dairy farms, and it's located right off of I-65. You can tour the dairy barns, birthing room, milking station, etc. While a tad overpriced ($10 per person... a little steep), I think I'd still make a stop there on our next trip up north. (It's actually an ideal stopping point on the way to or from Chicago, something we hope to do this winter.) It has plenty for little ones to do to get the wiggles out on a long car trip. Anyway, the next time we visit, it will be for one thing only. This bad boy. Yum. And I know my husband will add ice cream to his order. The best part? You can skip the $10 entrance fee and just head straight to the cafe to order up these treats. Nothing like eating cheesy milky ice creamy goodness just steps away from the cows who make it possible. As the arrow would say, "Moo!" This post is a part of Wanderfood Wednesday at Wanderlust & Lipstick. A few months back, I heard about a really amazing campaign among a group of travel bloggers called Passports with a Purpose. Last year, this group raised an astonishing $30,000, which was used to build a school in rural Cambodia. You can read about the school here. How does a group of travel bloggers raise that kind of money? It's pretty genius, actually. Many of the bloggers procure a prize from a generous sponsor. Then they encourage their readers to donate to the cause. For each $10 donated, you can register to win a particular price. I don't have an amazing prize to offer. But I am including Passports with a Purpose in my holiday giving plans, and I hope you'll consider doing the same. While I'd love to win a prize (you can see a list here), my motivation and heart lies with a group of Dalits (India's untouchables) who desperately need housing, training and agricultural assistance. All money donated goes directly to Friends of LAFTI Foundation, an NGO that specializes in assisting impoverished Indian villages. It's none of my business what your world view is, how you choose to spend your hard-earned money, and who you choose to help. But me? I firmly believe that never in history has our world been more interconnected. To some, that's scary. Instead, I think it means the horizon never really ends, and that we're all neighbors on this great big planet. 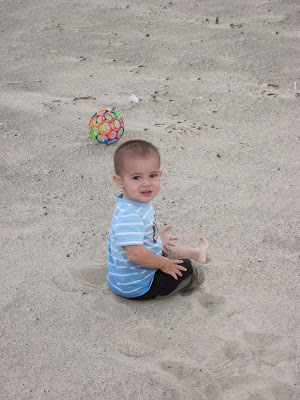 It's why I travel, it's why I want my son to grow up traveling. So what's the use in building one village in a country where thousands, if not millions, of others need help? Well, to those people, my neighbors, it's everything. Now you know what the PwP button on the left is all about. I hope you'll give it a click. Over the next few weeks, mostly on Tuesdays, I'll be profiling some of the other participants and their prizes. 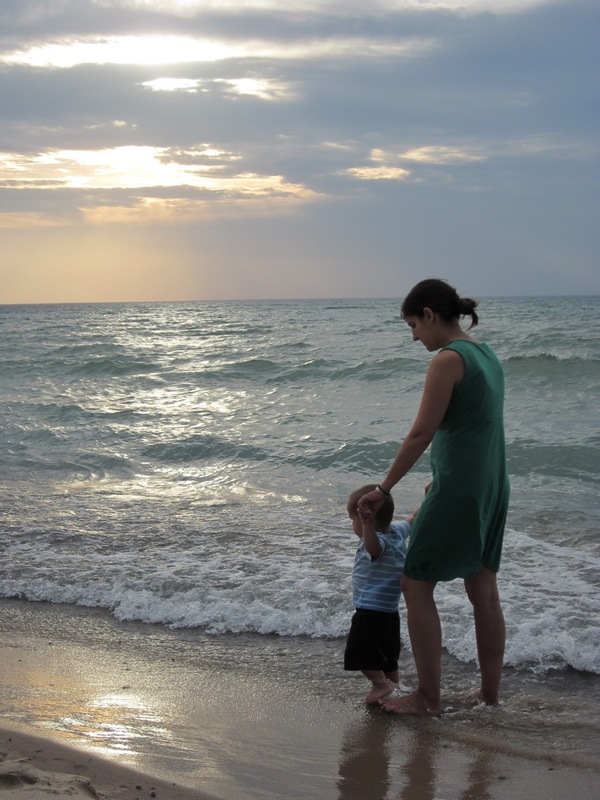 Today I'm linking up with Best Family Travel Advice. From here, you can see a few of the posts people are writing today in recognition of Passports with a Purpose's launch. The arrow saw some of us sniffing the plants found in the Steele Herb Garden at the Desert Botanical Garden in Phoenix and he just couldn't resist joining in. Luckily, dad was happy to give him a lift. You can read more about our visit to the Gardens here and the rest of our trip here. Let me introduce you to Go Explore Nature! I've said this before, but finding amazing blogs to read has been the best part of starting a blog of my own. These blogs inspire me, humor me, and humble me in so many different ways. 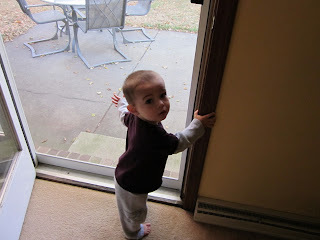 The arrow begging to go outside. A daily routine. A true favorite of mine? Go Explore Nature. This was the case even before Debi was kind enough to ask me to do a guest post on how my family enjoys nature in Indiana. She posted it today, and I was thrilled to have the opportunity to share this information. If you're visiting Arrows Sent Forth from Go Explore Nature, welcome! My blog isn't entirely nature-focused, but as you'll see if you scan through some past posts, we spend a lot of time outside. 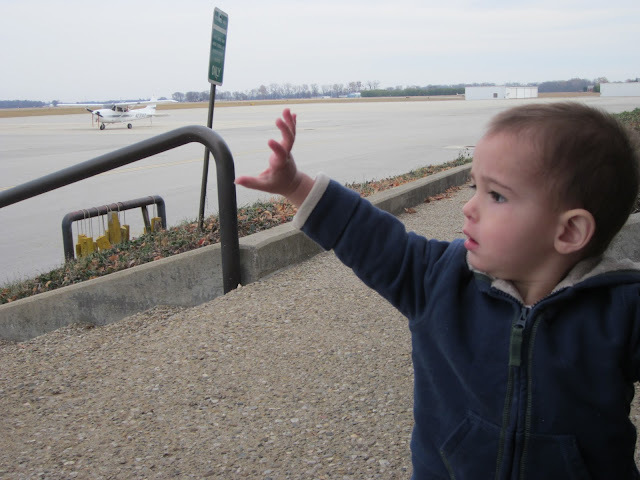 Since I've only taken two flights with the arrow, I feel very unqualified to offer up advice on flying with a toddler. But I did pick up a trick or two on our to/from Phoenix flights that I wanted to share. And my best piece of advice? Just do it. You'll survive, I promise! 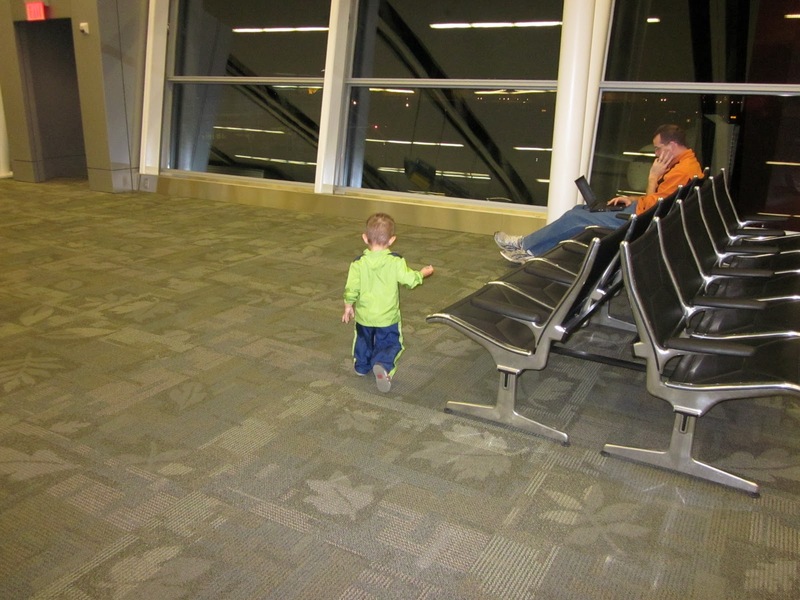 1) Waiting in the terminal is not the time to be a lazy parent. 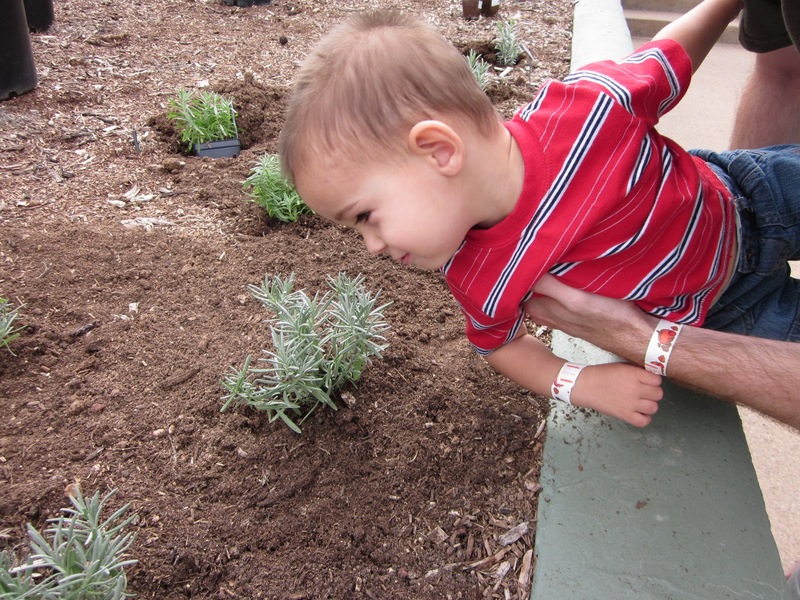 Get up and move with your toddler! Find an empty waiting area, explore the people movers, if nothing else, stand at the windows and look at the planes. Just move. 2) A well organized activity bag. I spent a lot of time packing our two carry-ons for maximum toddler entertainment. I think I'll be blogging more about that in the future. If you're the top of person who throws a few things in a bag before heading to the airport, you might want to put a little more thought into your carry-on when flying with a little one. 4) Put the plane to work for you. The arrow had fun looking out the window, especially while we were on the ground. We pointed out the guys putting bags on the plane, the orange wands they waved to direct the pilot, and the buildings below us getting smaller and smaller. He liked playing with the window shade. So we spent as much time on all these things as possible, which meant we didn't have to dip into our bag of tricks as often. 5) Don't be terrified of crying. First of all, the engine noise really does mute it. You'll probably only be bothering those seated immediately next to you. We knew when the arrow had reached the point of exhaustion and then we stopped trying to entertain him. He started to cry, so I rocked with him in my arms and whispered some songs he likes in his ear. He continued to cry, but two minutes later, he was sound asleep. I'll take 2 minutes of crying in exchange for a 45 minute nap, and I'm sure my fellow passengers agreed. 6) Divide and conquer. When boarding, my husband got on as soon as he was allowed to with all our bags. He got us situated, bags stowed, etc. Then I waited with the arrow (running around the terminal, remember?) until most passengers had boarded. This cut down on our time on the plane by at least 15 minutes. 7) Pick a few favorites, and a few new items. We brought a lot of the arrow's favorite books, because I knew he liked looking at them over and over. But I also packed a few new treats, and he really enjoyed playing with something new for a while. We saved the new things for when we were struggling a bit, and the novelty of whatever it was reduced the fussiness. 8) Snacks. Always a good time killer. Like the tip above, I packed some of his favorite snacks, and also a few things he'd never had before that I knew he'd like. Same strategy as above. And a shout-out to the Gerber Graduates Juice Treats. Not something I'd ordinarily feed the arrow, but they were really chewy and helped his ears to pop. 9) Forbidden items. Is there something your toddler loves that you never let him play with? Is there a way to take advantage of that on a plane? The arrow has broken two pairs of sunglasses and constantly tries to swipe my husband's glasses, so they are always off limits. Before our flight, I bought a cheap pair of kiddie sunglasses, and packed that in our carry-on. He was thrilled to finally be able to play with glasses! 10) Read what the real experts have to say. 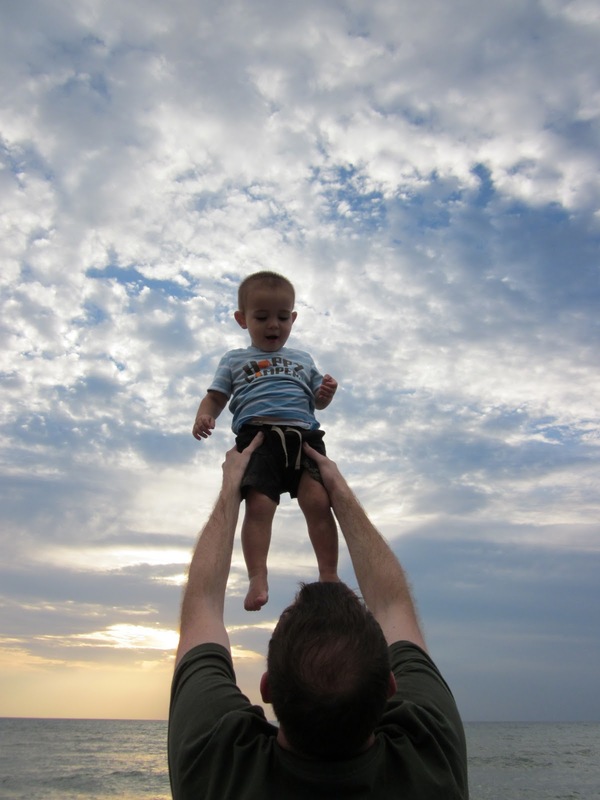 I relied greatly on the wise advice of Delicious Baby's flying suggestions. Find a blogger with kids your age, and see what they do to pass the time on a plane. This post is a part of Top 10 Tuesday at Oh Amanda. One of the highlights of our trip to Phoenix was an outing to the Desert Botanical Garden. 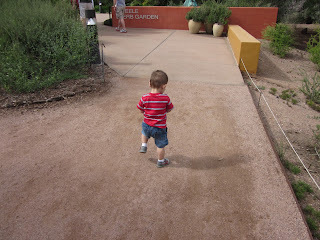 On a previous (kid-less) trip to Phoenix, I visited the Gardens first thing in the morning. The only people I remember seeing besides my mom and sister were a few employees. On this trip, when we pulled into a packed parking lot around 11 a.m., I feared I may regret coming. But it was surprisingly still a fairly peaceful way to talk a walk in the desert. My favorite aspect of the Desert Botanical Gardens is the variety. You'll see so many unique plants and landscapes when you visit. 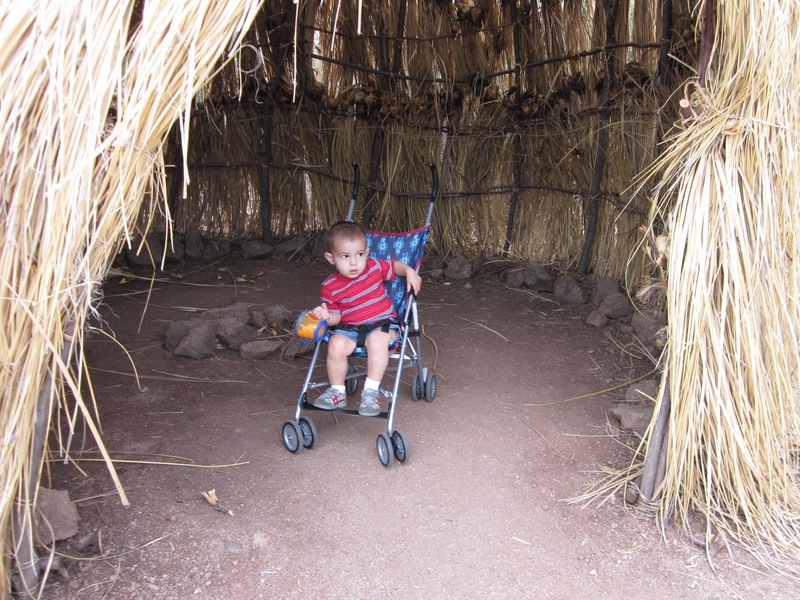 There are also examples of homes that desert dwellers built and lived in back in the day, along with small exhibits about other aspects of desert life. The arrow thought the huts were pretty cool and we adults learned a lot. 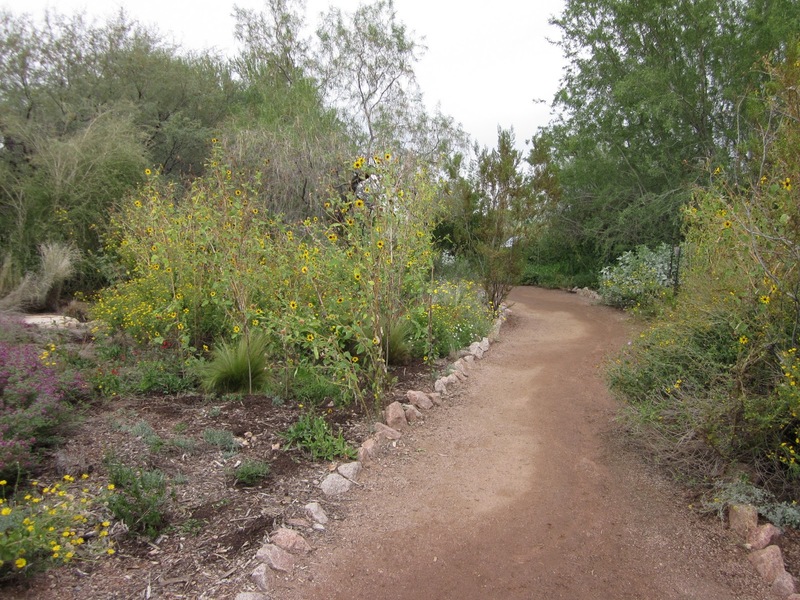 There are a variety of walks and trails at the Gardens. All were very stroller friendly. It was fun to let the arrow loose and watch him romp around a bit, too. If you go with kids, you might want to think through your strategy of which trails to cover and in which order. 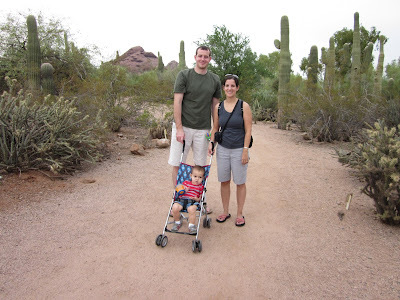 We tried to see as much of the Gardens as possible during our visit (beginning with the Desert Discovery Loop Trail, which runs throughout the Gardens, then the Herb Garden Trail, followed by the Plants and People of the Sonoran Desert Loop Trail, and ending with the Desert Wildflower Loop Trail). By the time we got to the wildflower trail, the arrow was getting a little cranky. The Plants and People of the Sonoran Desert Trail would probably be the most interesting for kids, especially those a little older than the arrow. So on this chilly Monday, I'm dreaming of cactus lining my path, sun on my face, and beautiful desert scenery all around me. This post is a part of Mondays are for Dreaming at The Mother of All Trips. 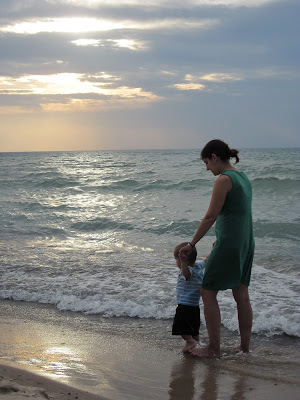 I know I blog about adventures with our son. But every once in a while, I love leaving him with an adoring grandparent or two so that my husband and I can have a quiet meal or sometimes even an overnight away. We try to do this once a month, although admittedly we're not always successful. 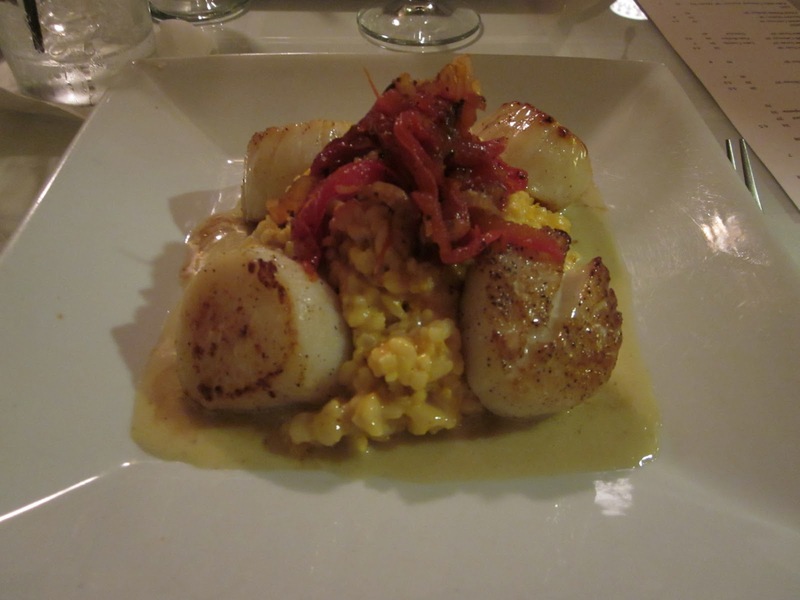 A couple of weeks ago for our anniversary, we headed to our favorite restaurant in Columbus, Tre Bicchieri. I blogged about our dinner there and other Columbus dining options at the Indiana Insider this week. We're lucky that even though we live an hour away from Indianapolis, we have several great local restaurants here in town that are perfect for kid-free evenings. Nothing says date night like having a cocktail to start the meal! 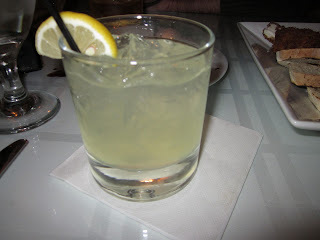 This is one of Tre Bicchieri's signature drinks: Tuscan Lemonade. Vodka, limoncello and lemonade. It was dangerously good! These scallops melted in my mouth. And while I over-did the appetizers and couldn't finish that pile of risotto, it was heavenly the next day for lunch. Kid-free time continues this weekend when we head to Connecticut for a friend's wedding. I openly admit to being thrilled to be boarding an airplane with a People magazine and my knitting needles instead of a 20 pound bag of toys and treats to keep the arrow entertained. Although I know we'll miss him! Happy to announce that Random.org selected Comment #10 as the winner of the Yo Gabba Gabba cd. Jessyca, I've sent you a message with all the details, be sure to write me back by Nov. 7 or another winner will be selected. Thanks to all who commented! ﻿Hope everyone had a fun Halloween! The arrow spent the day chasing after his cool older cousin (who is very worthy of the arrow's affection) and acting totally annoyed with his younger cousin (who is the sweetest, most beautiful 10 month old girl ever). We love when my sister's adorable family comes to visit. 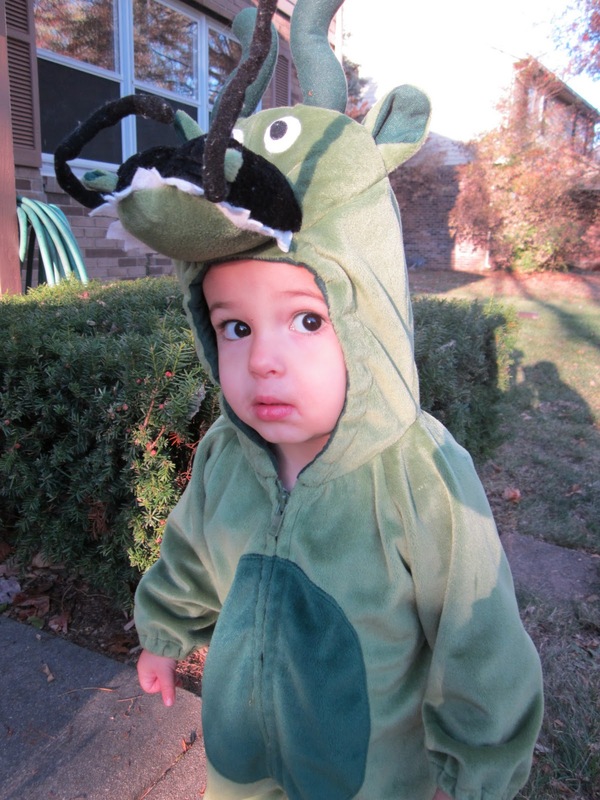 In the evening, the arrow-turned-dragon hung out in the front yard and helped me pass out candy. All in all, a fantastic Sunday! Looking for some kids as cute as the arrow? 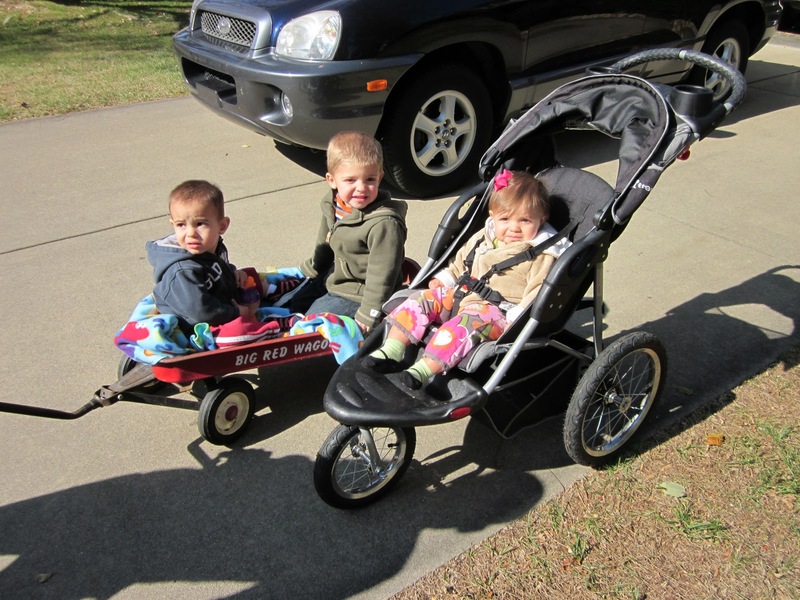 Let me introduce you to my niece and nephew. he refused to pull down his "hood" even when we came inside the house.